If you hadn’t heard of Dynamo; Magician Impossible before, you most certainly will have now. He caused quite a buzz as he levitated around London on the side of a double-decker bus last month. 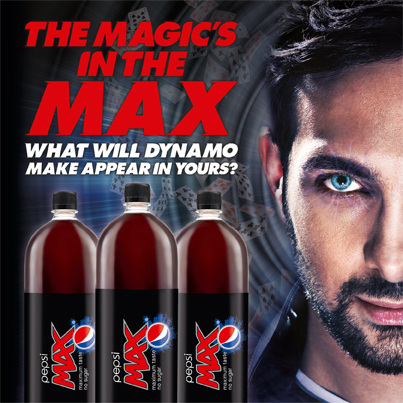 He’s famous for making magic happen, and right now he’s making 100s of fantastic prizes appear inside promotional packs of Pepsi MAX. He’s also working his magic for Ocado fans – making 2L bottles of Pepsi MAX magically appear inside 2,000 Ocado customer orders! To bag a bottle with your next shop, follow the steps below. This entry was posted in Freebies, Talking Ocado and tagged double decker bus, freebie, Ocado, pepsi max, shopping by Ocado. Bookmark the permalink. Hello, yes this piece of writing is actually nice and I have learned lot of things from it concerning blogging.